The Sino-Tibetan languages form the largest language family in the world in terms of native speakers, of whom there are some 1.4 billion spread across East Asia, Southeast Asia and parts of South Asia. The family consists of two branches: Sinitic, consisting of the Chinese languages (including Cantonese and Hakka), and Tibeto-Burman, which as well as Tibetan and Burmese includes several hundred further languages spoken from the Tibetan plateau in the north to the Malay peninsula in the south, and from northern Pakistan in the west to northeastern Vietnam in the east. This four-volume collection focuses on journal articles, with a small selection of seminal contributions from the book literature. Although the majority of the material is drawn from sources published in the past thirty years, some classic pieces are included; for example, a paper on Tibetan initials by F. K. Li which was published in 1933 and has never been surpassed. This new Major Work from Routledge is a set which someone new to the field of Sino-Tibetan studies could go to in order to get a general idea of the development and current state of the art of the subject, as aside from the seminal articles, there are introductions by the Editor that contextualise the articles and also cite relevant literature that built on the seminal articles. A veteran could also go to these volumes as an easy source for the most frequently cited articles in the field. 1. Fang-Kuei Li, ‘Languages and Dialects’, Journal of Chinese Linguistics 1, 1, 1973, 1-13. Originally published in The Chinese Year Book (Shanghai, 1937), pp. 121-128. 2. 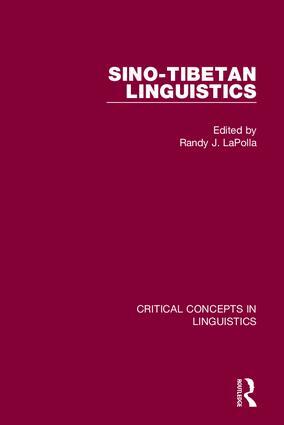 Paul K. Benedict, ‘Where it All Began: Memories of Robert Shafer and the "Sino-Tibetan Linguistics Project", Berkeley 1939-1940’, Linguistics of the Tibeto-Burman Area 2, 1, 1975, 81-92. 3. Paul K Benedict, ‘Thai, Kadai, and Indonesian: A New Alignment in Southeastern Asia’, American Anthropologist 44, 1942, 576-601. 4. Robert Shafer, ‘Classification of the Sino-Tibetan Languages’, Word 11, 1, 1955, 94-111. 5. James A Matisoff, ‘Notes on Fang-Kuei Li's "Languages and Dialects of China"’, Journal of Chinese Linguistics 1, 3, 1973, 471-474. 6. Paul K. Benedict, ‘Sino-Tibetan: Another Look’, Journal of the American Oriental Society 96, 2, 1976, 167-197. 7. James A Matisoff, ‘On Megalocomparison’, Language 66, 1, 1990, 106-20. 8. Paul K Benedict, ‘Comment on Matisoff’s Comparison between Greenberg and Benedict’, Linguistics of the Tibeto-Burman Area 14, 2, 1991, 169-70. 9. James A Matisoff, ‘Sino-Tibetan Linguistics: Present State and Future Prospects’, Annual Review of Anthropology 20, 1991, 469-504. 10. Robbins Burling, ‘The "Sal" Languages’, Linguistics of the Tibeto-Burman Area 7, 2, 1983, 1-32. 11. Karen H. Ebert, ‘On the Evidence for the Relationship Kiranti-Rung’, Linguistics of the Tibeto-Burman Area 13, 1, 1990, 57-78. 12. Jackson T.-S Sun, ‘The Linguistic Position of Tani (Mirish) in Tibeto-Burman: A Lexical Assessment’, Linguistics of the Tibeto-Burman Area 16, 2, 1993, 143-88. 13. Jean Przyluski and Gordon H. Luce, ‘The Number "A Hundred" in Sino-Tibetan’, Bulletin of the School of Oriental Studies 6, 3, 1931, 667-8. 14. Stuart N. Wolfenden, ‘Concerning the Variation of Final Consonants in the Word Families of Tibetan, Kachin and Chinese’, Journal of the Royal Asiatic Society 4, 1937, 625-655. 15. Randy J LaPolla, ‘Variable Finals in Proto-Sino-Tibetan’, Bulletin of the Institute of History and Philology 65, 1, 1994, 131-173. 16. Gong Hwang-cherng, ‘A Comparative Study of the Chinese, Tibetan, and Burmese Vowel Systems’, Bulletin of the Institute of History and Philology 51, 3, 1980, 455-489. 17. Eugénie J. A. Henderson, ‘The Topography of Certain Phonetic and Morphological Characteristics of South East Asian Languages’, Lingua 15, 1965, 400-434. 18. Mantaro J. Hashimoto, ‘Language Diffusion on the Asian Continent: Problems of Typological Diversity in Sino-Tibetan’, Computational Analyses of Asian and African Languages (National Inter-University Research Institute of Asian and African languages and cultures, Tokyo) 3, 1976, 49-66. 19. Mantaro J. Hashimoto, ‘Origin of the East Asian Linguistic Structure: Latitudinal Transitions and Longitudinal Developments of East and Southeast Asian Languages’, Computational Analyses of Asian and African Languages (National Inter-University Research Institute of Asian and African languages and cultures, Tokyo) 22, 1984, 35-41. 20. Li Fang-Kuei, ‘Some Old Chinese Loan Words in the Tai Languages’, Harvard-Yenching Journal of Asiatic Studies 8, 1945, 333-342. 21. Li Fang-Kuei, ‘Sino-Tai’, Computational Analyses of Asian & African Languages (National Inter-University Research Institute of Asian and African languages and cultures, Tokyo) 3, 1976, 39-48. 22. Oi-Kan Yue-Hashimoto, ‘Southern Chinese Dialects: The Tai Connection’, Computational Analyses of Asian and African Languages (National Inter-University Research Institute of Asian and African languages and cultures, Tokyo) 6, 1976, 1-9. 23. Jerry Norman and Tsu-lin Mei, ‘The Austroasiatics in Ancient South China: Some Lexical Evidence’, Monumenta Serica 32, 1976, 274-301. 24. R.A.D. Forrest, ‘The Linguistic Position of Róng (Lepcha)’, Journal of the American Oriental Society 82, 3, 1962, 331–335. 25. Nicholas Bodman, ‘On the Place of Lepcha in Sino-Tibetan: A Lexical Comparison’, Linguistics of the Tibeto-Burman Area 11, 1, 1988, 1–26. 26. Theodore Stern, ‘Language Contact between Related Languages: Burmese Influences upon Plains Chin’, Anthropological Linguistics 4, 1962, 1-28. 27. Denise Bernot, ‘Influence of Burmese Language on Some Other Languages of Burma (Writings Systems and Vocabulary)’, Journal of the Siam Society 63, 1975, 96-109. 28. Hla Pe, ‘A Tentative List of Mon Loanwords in Burmese’, Journal of the Burma Research Society (Rangoon) 50, 1, 1967, 71-94. 29. David Bradley, ‘Phonological Convergence Between Languages in Contact: Mon-Khmer Structural Borrowing in Burmese’, Berkeley Linguistic Society 6, 1980, 259-67. 30. John Okell, ‘Nissaya Burmese: A Case of Systematic Adaptation to a Foreign Grammar and Syntax’, Lingua 15, 19564, 186-227. 31. Dipankar Moral, ‘North-East India as a Linguistic Area’, Mon-Khmer Studies 27, 1997, 43-53. 32. Edward H. Bendix, ‘Indo-Aryan and Tibeto-Burman Contact as Seen Through Nepali and Newari Verb Tenses’, International Journal of Dravidian Linguistics 3, 1974, 42-59. 33. Charles N. Li, ‘Languages in Contact in Western China’, Papers on East Asian languages 1, 1983, 31-51. 34. Arienne M. Dwyer, ‘Altaic Elements in the Linxia Dialect: Contact-induced Change on the Yellow River Plateau’, Journal of Chinese Linguistics 20, 1, 1992, 160-179. 35. Bernhard Karlgren, ‘Word Families in Chinese’, Bulletin of the Museum of Far Eastern Antiquities 5, 1933, 9-120. 36. Bernhard Karlgren, ‘Cognate Words in the Chinese Phonetic Series’, Bulletin of the Museum of Far Eastern Antiquities 28, 1956, 1-18. 37. G. B. Downer, ‘Derivation by Tone-Change in Classical Chinese’, Bulletin of the School of Oriental and African Studies 22, 1/3, 1959, 258-90. 38. Mei Tsu-lin, ‘Tones and Prosody in Middle Chinese and the Origin of the Rising Tone’, Harvard Journal of Asiatic Studies 30, 1970, 86-110. 39. E. G. Pulleyblank, ‘Some New Hypotheses Concerning Word Families in Chinese’, Journal of Chinese Linguistics 1, 1, 1973, 111-125. 40. E. G. Pulleyblank, ‘Some Further Evidence Regarding Old Chinese -s and Its Time of Disappearance’, Bulletin of the School of Oriental and African Studies 36, 2, 1973, 368-73. 41. W. South Coblin, ‘Fangyan Gleanings’, Monumenta Serica 37, 1986/87, 113-143. 42. Jerry L. Norman and W. South Coblin, ‘A New Approach to Chinese Historical Linguistics’, Journal of the American Oriental Society 115, 4, 1995, 576-584. 43. Derek D. Herforth, ‘A Case of Radical Ambiguity in Old Chinese: Some Notes Toward a Discourse-based Grammar’, Suzugamine Joshi Tanki Daigaku Bulletin of Humanities and Social Science Research 34, 1987, 31-40. 44. Chao-Fen Sun, ‘The Adposition YI and Word Order in Classical Chinese’, Journal of Chinese Linguistics 19, 2, 1991, 202-218. 45. Yuen-Ren Chao, ‘A System of Tone Letters’, Le Maître Phonétique 45, 1930, 24-27. 46. Yuen-Ren Chao, ‘The Non-uniqueness of Phonemic Solutions of Phonetic Systems’, Bulletin of the Institute of History and Philology 4, 4, 1934, 363-397. 47. Charles F. Hockett, ‘Peiping Phonology’, Journal of the American Oriental Society 67, 4, 1947, 253-267. 48. Fang-Kuei Li, ‘The Zero Initial and the Zero Syllabic’, Language 42, 2, 1966, 300-302. 49. M. A. K. Halliday, ‘A Systemic Interpretation of Peking Syllable Finals’, in P. Tench (ed. ), Studies in Systemic Phonology (London & New York: Pinter, 1992), pp. 98-121. 50. Jerry Norman, ‘Tonal Development in Min’, Journal of Chinese Linguistics 1, 2, 1973, 222-238. 51. Mantaro J. Hashimoto, ‘Hakka in Wellentheorie Perspective’, Journal of Chinese Linguistics 20, 1992, 1-48. 52. Anne Oi-kan Yue-Hashimoto, ‘The Lexicon in Syntactic Change: Lexical Diffusion in Chinese Syntax’, Journal of Chinese Linguistics 21, 1993, 213-253. 53. Randy J. LaPolla, ‘Arguments Against "Subject" and "Direct Object" as Viable Concepts in Chinese’, Bulletin of the Institute of History and Philology 63/4, 1993, 759-813. 54. Fang-Kuei Li. ‘Certain Phonetic Influences of the Tibetan Prefixes Upon the Root Initials’, Bulletin of the Institute of History and Philology 6, 2, 1933, 135–157. 55. W. South Coblin, ‘Notes on Tibetan Verbal Morphology’, T’oung Pao 62, 1976, 45-70. 56. Walter Simon, ‘Alternation of Final Vowel with Final Dental Nasal or Plosive in Tibetan’, Bulletin of the School of Oriental and African Studies 15, 1, 1977, 51-7. 57. Robbins Burling, ‘The Addition of Final Stops in the History of Maru (Tibeto-Burman)’, Language 42, 3, 1966, 581-86. 58. Eugénie J. A. Henderson, ‘Colloquial Chin as a Pronominalized Language’, Bulletin of the School of Oriental and African Studies 20, 1957, 323-27. 59. Jim Bauman, ‘Pronominal Verb Morphology in Tibeto-Burman’, Linguistics of the Tibeto-Burman Area 1, 1, 1974, 108-55. 60. Randy J. LaPolla, ‘On the Dating and Nature of Verb Agreement in Tibeto-Burman’, Bulletin of the School of Oriental and African Studies 55, 2, 1992, 298-315. 61. Randy J. LaPolla, ‘Parallel Grammaticalizations in Tibeto-Burman: Evidence of Sapir’s "Drift", Linguistics of the Tibeto-Burman Area 17, 1, 1994, 61-77. 62. Tej R. Kansakar, ‘Verb Agreement in Classical Newar and Modern Newar Dialects’, in Y. P. Yadava and W. W. Glover (eds), Topics in Nepalese Linguistics (Kathmandu: The Royal Nepal Academy, 1999), pp. 421-443. 63. Scott DeLancey, ‘The Historical Status of the Conjunct/disjunct Pattern in Tibeto-Burman’, Acta Linguistica Hafniensia 25, 1, 1992, 39-62. 64. James A. Matisoff, ‘Lahu Nominalization, Relativization, and Genitivization’, in John P. Kimball (ed. ), Syntax and Semantics, Vol. I (New York: Academic Press, 1972), pp. 237-57. 65. Alton L. Becker, ‘A Linguistic Image of Nature: The Burmese Numerative Classifier System’, International Journal of the Sociology of Language: Sociolinguistics in Southeast Asia 5, 1975, 109-21. 66. James A. Matisoff, ‘Tonogenesis in Southeast Asia’, in Larry M. Hyman (ed. ), Consonant Types and Tone (Southern California Occasional Papers in Linguistics, No. 1) (Los Angeles: UCLA, 1973), pp. 72-95. Randy J. LaPolla is Professor of Linguistics amd Multilingual Studies, Nanyang Technological University, Singapore.